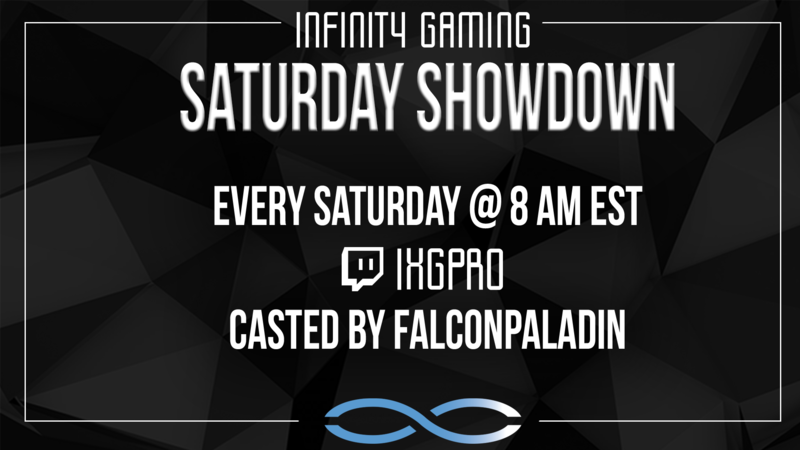 Introducing the Infinity Gaming Saturday Showdown! Each week will feature 2 separate events, starting with an individual player best-of-5 then followed by a team all-kill. This event is done in a King of the Hill format where the winner’s return the following week. Like the name says, these will take place every Saturday and will start at 8AM EST. It will be casted live on our Twitch by FalconPaladin. If you ever miss the live stream you can find the VOD on FalconPaladin’s YouTube. To keep up with the news on the Saturday Showmatches and everything Infinity Gaming, check out https://infinitygaming.gg/, join our Discord and follow our social medias - @IxGpro. Thanks to everyone who tuned in, and thanks to Psionic Aftermath for joining us for some great games! Make sure to tune in next week, and keep an eye on FalconPaladin's youtube for the VOD! Then we have Infinity Gaming vs Wolf's Lair in a best of 7 all-kill! Check us out live on twitch or watch the VODS after the game! This week the Team match will have a revive system. Then a best of 7 all-kill format between Infinity Gaming and PsiStorm winning team will take on Iron Chain next week. This week we have something special for you all we will have a Infinity Gaming free for all. Right have the Free for all concludes we will have Iron Chain vs Infinity Gaming in a best of 7 all-kill. Will the Clem - Harstem match be played anohter date?